Choosing your new acoustic guitar can be quite an overwhelming process because there are a multitude of great instruments in the market asking out for your attention. Guitar makers make use of a variety of hardware, design elements and wood, and there are a hundred other factors to consider. But once you have got the bug, you only relax when you have got the best acoustic guitar narrowed down that just rightly suits your needs. In the world of instrument builders, Yamaha has covered a long journey from 1887 from being just an organ maker to becoming one of the largest and popular musical instrument manufacturers of the world. Yamaha is a Japanese corporation that has grown up to become the major supplier of musical instruments. Yamaha builds various kinds of instruments, the most popular among them including a wide range of acoustic guitars famous for their accessibility and playability that suits to musicians of different skill levels. 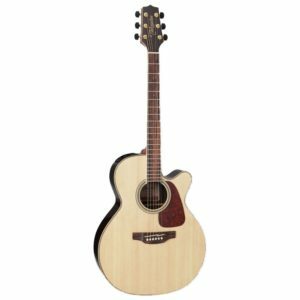 Acoustic guitars offered by Yamaha are great choices, irrespective of whether you are a beginner or a professional guitarist. Yamaha acoustic guitar lineup includes the L series, FS, F and FG series. All of these guitars range from classic dreadnoughts to high tech silent model that are designed to outperform and last longer. Yamaha acoustic guitars are built on the formula of flaunting a great body and being accessible to all musicians. They definitely follow this tradition and irrespective of your musical style, you will always find an instrument perfectly suitable for you in this section. The x-bracing that is non-scalloped gives longevity and durability for the guitar. This also ensures the retention of the response, tone, and stability. The Dovetail neck makes it easy for the vibrations to transfer from the neck to body. The hand-spraying techniques and finish technology give a loud and clear tone while keeping the guitar wood intact for a long time. This guitar can be played by right-handed guitarists. 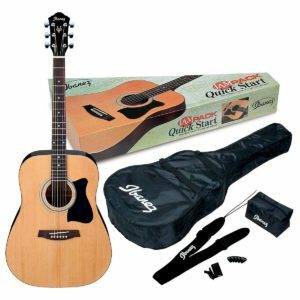 This Gisbon Corporation acoustic guitar organization produces high sound quality and also the price ranges have been kept at really low. Its rosewood fingerboard as well as bridge allow for easy and comfortable playing. The fingerboard of this acoustic guitar is made of rosewood and the inlays are arranged as pearled parallelogram. The spruce tonewood is known for its ability to improve the sound quality with time. The neck and the body are made of mahogany. The shadow pickup system can convert any gig into an acoustic sound. Fender Business makes Squire guitars that are famously identified for the electric ones made from Scottsdale, Arizona. These are extremely durable acoustic guitars built to suit the school music newbies and program learners. With an amazing sound, these brands are known to build low priced models like MA1 and SA100. The Squier acoustic guitars that are made for right-handed guitarists are known for their exceptional tone. This is accomplished through the spruce top that is upgraded and laminated. Die-cast tuning machines and saddle give tuning stability and precise intonation to the Squire acoustic guitars. This model is cheaper when compared to some of the acoustic guitar models in the market. The frets used are plated with nickel. The guitar measures 20 x 44 x 7 inches and weighs 9 pounds. The fretboard and the bridge are made of rosewood. When you order this guitar you will get the picks, gig bag, and tuner with the pack so that you can start playing the guitar. The Squier acoustic guitars are easy to handle. 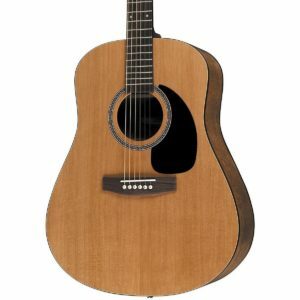 this can be best cheap acoustic guitar in list. Considered to be amongst the best brands for best-selling bass guitar and electric guitars, Ibanez guitars produce quality acoustic guitar for beginners. Amongst the newbies, the popular ones include V series which uses mahogany wood on the back, sides and neck of the guitar. Also it features a rosewood bridge and guitar fretboard. 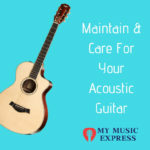 Ibanez is in the guitar manufacturing market for a long time and they are known for producing best cheap acoustic guitar that are suitable for budding guitarists. 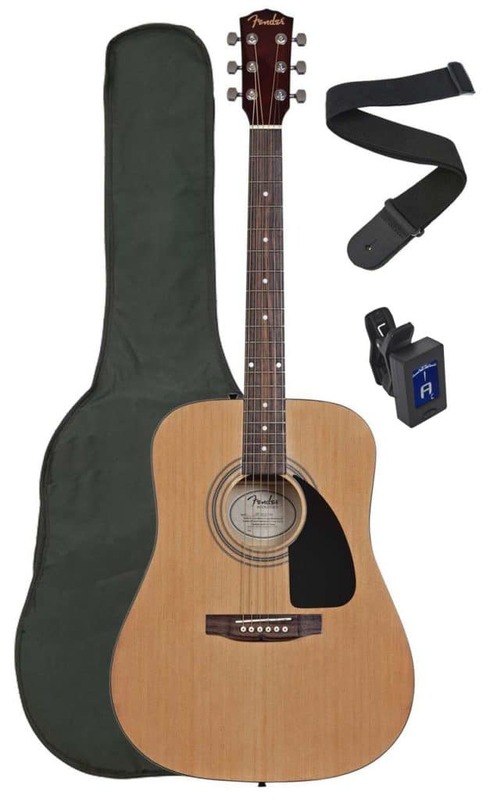 The pack also includes accessories need for the guitarist to play the instrument right out of the box. The accessories included are gigbag, tuner, strap, and pouch to keep accessories. The Ibanez acoustic guitars measure 38 x 5 x 12 inches and weigh 7 pounds. The top of the Ibanez acoustic guitars is laminated and has 18-inch long fret board. The guitar’s hand orientation is Ambidextrous – can be used by both right-handed and left-handed people. The neck is made of Mahogany and fretboard is made of rosewood. This Korean manufacturing company has been famous for constructing pianos by making use of imported pieces. Samick produces more a million guitars every year and their high quality acoustic guitars produce exceptional sound. The various brands under this company include Abilene, Greg Bennett, Samick and Silvertone. In short, the Samick acoustic guitars can be described by the below features. Nato Mahogany is used to make the neck, top, sides, and back of the guitar. The X-style bracing and the body gives balanced tone and volume. 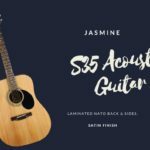 The Samick acoustic guitars are manufactured by keeping durability in mind.The company has been making acoustic guitars for over 40 years now and they have been doing this for some of the famous brands in the market. This proves their credibility in the market. Being a Washburn Guitars brand, they bring some of the best resonant sound quality, smooth fret ends and precise low action. Amongst the bestselling guitars of the brand include OG2 and OG3. Other traditional musical instruments under this brand are autoharps and ukuleles. High end expensive guitars from Taylor produce amazingly exceptional sound quality. The brand uses some of the best wood that make for its finest sound quality. For those who want some really fine tunes at a great price, the Taylor Baby Spruce BT1 and the Taylor Baby Mahogany BT2 are amongst the acoustic guitar . The pack comes with the gig bag so that the guitar can be carried around easily. The Japanese guitar manufacturing company has spent almost half a century committed towards innovation and advancement of acoustic guitars. Although pricey, the cost is more than worth for the sound. this one is good acoustic guitar for beginners. The sleek NEX-style body of the Takamine acoustic guitars gives them a grant look. The top is made of spruce, the sides are made of rosewood, and the back is made using three pieces of rosewood and maple that is quilted. The onboard preamp system (TK-40D) of the Takamine acoustic guitars makes it easy to produce distinct sound and playability. The 12-inch neck is made of mahogany and the EQ bypass switch gives the player the flexibility and sound quality.The maple binding and dark wood body purfling give a classic look to the Takamine acoustic guitars. The rosewood fingerboard and natural gloss finish givean elegant look to the guitar. This Canadian company manufactures some of the finest hand crafted acoustic guitar . The solid top guitars offer broader dynamic range and richer sound that only gets better with time. The neck of a Seagull guitar is either from Honduras mahogany or Silver leaf maple. Silver leaf, being less permeable than the mahogany ones provide a smoother sensation, however produce an identical denseness. From the Seagull lineup, some of the acoustic guitar include Original S6 cedar, entourage Rustic CW QI and Entourage Rustic S6. Depending on whether you are at home recording, gigging out or looking out for a fine collectible just to indulge yourself, following are the prime factors you would want to consider before heading out. Before you start considering body styles and brand names, think about what you would be using the guitar for and how much are you willing to spend for it. If you are planning on taking your guitar for public events or want to play a band, acoustic guitars would just serve your purpose right. They are equipped with a preamplifier and pickups and can be plugged into sound system or amplifier while still retaining their rich acoustic music and not limiting your mobility. The popularity of these hybrid guitars is on the rise and there is wide range to match all your budget requirements. 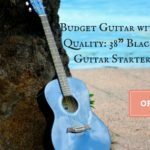 If you are beginner in this arena looking for some instrument to try your hands on, you wouldn’t want to spend a lot on some high end acoustic guitars. 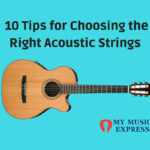 However, fortunately because of modern manufacturing techniques, you have a wide range of options from low to mid-range guitars to pick from. But if you are more of an experienced player and ready to upgrade to better options, know the various kinds of tonewoods and resonance effects of soundboard before purchasing. The right tonewoods for your guitar would largely depend on the kinds of sounds and music you like and you hope to play. For example, a fingerstyle player would want wood that easily responds to his delicate player as against to wood that demands more force such as using a pick for full resonance. Luthiers and guitar craftsmen usually believe that choosing your wood is the single most essential factor for consideration while choosing the best acoustic guitar. Apart from the top, the sides, back as well the necks constitute other important elements for deciding on overall tonality. Woods like binding, fretboard, bracing and bridge also work to constrain or enhance the acoustic guitar’s tonal effects- though they may not define the instrument sounds. In addition to the wood species, other factors like quality of wood employed, design features and skills of the maker are equally important. Nonetheless, tonewood selection stands to be on the deciding factors while creating specific guitars designed for specific purposes. The western Red Cedar is amongst the popular top woods used, primarily because of its warm and balanced sound. Cedar is especially favored by those fingerstyle players with lighter playing styles. Amongst the standard material used for tops, spruce is highly rigid and when combined with most softwoods having lightweight characteristics, produce natural and pleasant sounds. Sikta spruce, one of the commonly used species, has quite a powerful tone that is capable of withholding its clarity even when played forcefully. With a relatively lower response rate, low overtone content and considerable density, the mahogany topped acoustic guitars are well capable of playing strong punchy tones. When employed on sides and back, mahogany has a relatively higher sound velocity that contributes a lot of overtone coloration. Various of the maple species, like sugar, bearclaw and big leaf are somewhat more acoustically transparent because of their low response rates and higher internal damping degrees. This employs the top tonal characteristics to be heard even without adding significant tonal coloration. Known for its broader range of overtones and a higher response rate, rosewood is characterized by complexity and strength in its bottom end. With an overall darkness tone in all its other ranges, rosewood also accounts for richness in tone with strong mids and highs. 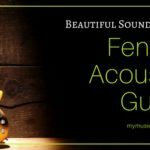 There are a lot of nuances relating to an acoustic guitar’s body style depending on the numerous companies that produce them. Thus, it’s imperative that you pick the one which produces the exact tone you want and is also amazingly comfortable to play while standing or sitting. While the exact measurements might vary from one manufacturer to other, some of the most popular acoustic body shapes include auditorium and grand auditorium, jumbo, dreadnought, concert and grand concert, and travel and mini acoustics. Auditorium and grand auditorium: A mid-sized standard acoustic guitar, the auditorium guitar style has a lower bout of similar width as that of a dreadnought, but has a relatively smaller waist. Having an orchestra body, they beautifully balance the tone, comfort and volume, and thus have regained popular grounds recently. The grand auditorium comes with a lower bout as compared to auditorium but is wider than the class dreadnought. However, with a narrower waist, such guitars protrude a larger volume range and greater balanced tone when evaluated against the smaller body styles. These are the big, boomy guitars which are often considered to be the standard for cowboys. At around 17 inches of lower bout, the jumbo guitars resonate deeply and project loudly. The dreadnoughts have a common body style of an acoustic guitar but have distinctive wide waists, 14 fret necks and square bouts. Ever since its first introduction in 1916, this style has been gaining popularity ever since. Dreadnoughts are most popular amongst the bluegrass guitarists because of their highly powerful driving sounds. 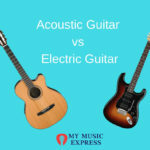 Travel and Mini acoustics: Usually amateur players or frequent travelers should go for travel and mini acoustic guitars. 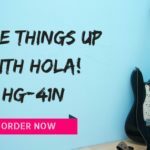 Designed to suit the comfort, convenience and requirements of smaller players, guitar manufacturers have come with smaller scale acoustic guitars by investing a lot of time and resources that do not compromise on sound or quality. Concert and Grand concert: The concert acoustic guitars go back to 1854. With a comfortable smaller size and punchy mid-range bright sounds, these guitars are most suitable for smaller musicians. With a relatively larger body style, grand concert acoustic guitars boast of stronger sounds and a good mig-range. The body styles of acoustic guitars play an important role in determining its tonal emphasis and sound projection. The two most essential things to consider are playing comfort versus tonal quality. Acoustic guitar bodies in a variety of shapes including single cutaway as well double cutaway designs. Acoustic guitars that come with preamplifiers and pickups are designed specifically for larger venues to suit bigger rooms. A few instruments have preamps that are mounted in holes cut towards the sides of the instrument and some others have it inside the sound hole. Most systems also combine preamplifiers, piezo pickups, tuners, EQ and microphones. Keep in the mind the size of your hands while considering the length of neck. The width and thickness of the neck is generally dependent on the instrument body size and frets in the neck. Usually acoustic guitars come listed as 12 or 14 frets. This determines that as and when you move up the neck, how pleasantly and beautifully the notes can play in tune. Usually when distance in between the frets is off, the acoustic guitar fails to play in tune and therefore is considered to be a useless performing instrument. Various kinds of wood are capable of producing varied tones as discussed above, however most guitar makers are of the opinion that the top is most essential in determining tonal quality. The common standard material for making tops is spruce. Depending on the rarity of tonewoods, the cost of guitars varies dramatically. Tuning machine of your guitar is one of the most essential elements as it allows for fine tuning and holding pitch of your guitar. Enclosed machine head are equipped to resist airborne corrosives and rust, thus do not require much replacement or maintenance as those of the open tuning machines. Finish: Various types of finish do affect the ways in which the wood vibrates, but there isn’t much that you can do about it. Since these decisions are made by guitar makers, all you need to do is choose wisely.